Fasting Feasting was my first encounter with Anita Desai’s writing. The book jolted me emotionally. I became an ardent fan of hers and religiously devoured Clear Light of Day and ‘Baumgartner’s Bombay‘. I like her style of writing in lyrical, fluid language, fusing imageries and dreams to create an impressive world, bustling with strong human emotions. After reading three novels, I decided to explore her story world as well and fortunately I got the book ‘Collected Stories’ consisting of not one but two of her famous collections – ‘Diamond Dust’ and ‘Games at Twilight’ as well as an independent story ‘The Landing’. With high hopes, I started reading the first story, ‘The Landing’ and immediately the rocket of my expectations took a nose dive and crashed onto the solid ground. The story looked like a wannabe Ramsay Brothers Horror movie, which will not scare even a baby! I was quite disappointed with her first story and had I not already read some of her good novels, I would have given up this book for good. But, thank God, I did not give up. As they say, to find rarer gems, one must dive deeper, so to find out the good stories of this collection, you would have to ignore the first two- three offerings and read ‘Diamond Dust: A Tragedy’. Quite ironically, this tragedy is one of the most entertaining and delightful story of the book, revolving around a lovely relationship shared by a burly dog and his simple owner. This story sets an ideal and the next stories just take the graph of Desai’s writing higher and higher, with her masterly strokes in ‘The Man who saw Himself Drown’, ‘Five Hours to Simla or Faisla’ and ‘The Rooftop Dwellers’. These four stories more than make up for the other slightly obscure and confusing ones, and redeemed the collection. The second collection ‘Games at Twilight’ consisted of eleven stories, each of them based on a single event, be it a game of hide and seek played by kids, a private tuition class by a poor Brahmin, or a farewell party. Anita Desai’s ability to delve into human psyche and understand his natural response, is beautifully reflected in this collection. I found this collection much more satisfying than the first one, as almost all the stories were good in their own unique way and a few like ‘Studies in the Park’ and ‘A Devoted Son’ stand out among others for their true portrayal of everyday events in a delightful manner. 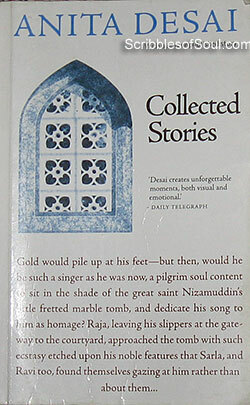 In short, I had a mixed feeling after reading Collected Stories by Anita Desai, and found some of the stories entertaining, with a few hiccups here and there. The book could have been made more enjoyable, by a clever placing of good stories at the beginning of the collection, so that the first time readers won’t feel dejected. Anita Desai is a writer par excellence, when she writes about the human world , but her wanderings into mystic and thriller realms, in stories like Royalty and Landing lacked cohesion and left me unconvinced.